Citizenship For Military Service Program Under Fire Thousands of foreign nationals with critical skills have served in the U.S. military in exchange for citizenship. The Trump administration is considering ending the program. 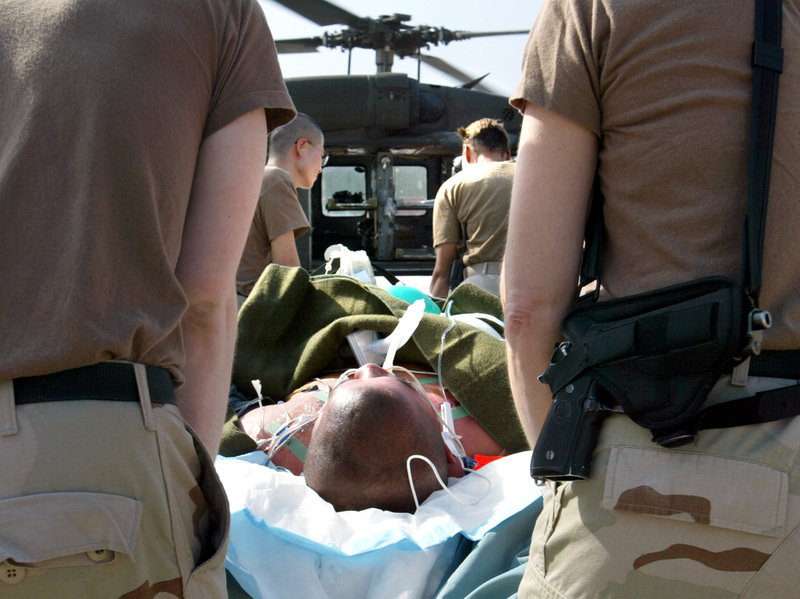 Medics and nurses load an injured American soldier onto a helicopter during the Iraq war. The Military Accessions Vital to the National Interest program is aimed at immigrants with special skills, such as in medicine. A debate has broken out at the Pentagon and in Congress over a proposal to dismantle an 8-year-old program that gives fast-track citizenship to immigrant soldiers who were recruited because they have critical skills in languages and medicine. More than 4,000 immigrant soldiers recruited through the program — mostly from China and South Korea — are serving in uniform, including on overseas tours. Another 4,000 recruits have enlisted and are awaiting training. The program is known as MAVNI, for Military Accessions Vital to the National Interest. It was frozen last year amid security concerns about inadequate vetting of the recruits. Pentagon and national intelligence officials say the recruits could have connections to foreign intelligence services or become insider threats, according to an internal memo obtained by NPR. The officials also said it would be both expensive and time-consuming to investigate these recruits more carefully. Those officials are now proposing additional scrutiny of soldiers already serving and dropping those who have not yet shipped to basic training or been assigned a military unit. Some could be deported because their visas have expired. A Pentagon spokesman, Johnny Michael, would not comment on the memo or the program. The proposal has stoked a debate over how to balance national security concerns with the need for specialized skills and how to keep faith with recruits who pledged to serve their adopted country. Several Defense Department officials, speaking on the condition of anonymity because they had not been authorized to discuss the program publicly, said mismanagement has been a problem. In some cases, the officials said, the military didn't use the MAVNI recruits effectively because they weren't placed in jobs in which they used their language skills. And some recruits have been investigated for suspected ties to foreign spy agencies, one official said. By some metrics, the program — which grants citizenship in exchange for eight years of honorable military service — has been successful. According to a Pentagon breakdown, soldiers recruited through the program have educational levels that exceed the Army average, and their re-enlistment rates are higher than soldiers who are already citizens. Most of the recruits with foreign language skills speak Chinese and Korean. The rest speak about three dozen other languages, ranging from Arabic and Thai to Indonesian, Turkish and Swahili. The program also helps fill the medical ranks. About two-thirds of dentists in the Army Reserve are part of the MAVNI program. Others serve as nurses or hold other jobs in the Army Medical Corps. One-third of the recruits have been in the United States for at least three or four years, according to the Pentagon's breakdown, with one-quarter living in the U.S. for more than seven years. One of those recruits is Jeevan Pendli, 34, who came to the U.S. from India on a student visa, earning a master's degree from Carnegie-Mellon University. He stayed on a visa for tech workers and co-founded a company that helps people with chronic illnesses manage their health. And last year he decided to join the Army, inspired after running the Marine Corps Marathon and seeing competitors in wheelchairs and using prosthetics. "Things seemed fine when we signed and did the oath in May," Pendli told NPR, "and it just fizzled out in a couple of weeks or months." Like some 2,000 other MAVNI recruits, Pendli is still waiting to be shipped to basic training. That long wait is more than just an annoyance. If a recruit doesn't make it to Army basic training by 730 days after signing a contract, the recruit "times out" and is kicked out before serving. Hundreds will reach that deadline by the end of the year. And each month after that hundreds more will "time out." "Military recruits in the MAVNI program should not have to wonder whether the United States will honor the contract they signed," wrote Sen. Mark Warner, D-Va., in a letter to Defense Secretary James Mattis. "If we fail to hold up the contracts we made with MAVNI applicants, this will not only have a significantly deleterious effect on recruiting, it will also be met with a strong, swift Congressional reaction." But other lawmakers say there are legitimate concerns. "Even with the MAVNI program, where it's supposed to meet some of the vital national interests, the program has been replete with problems to include foreign infiltration, so much so that the Department of Defense is seeking to suspend the program due to those concerns," said Rep. Steve Russell, R-Okla., a retired Army officer, during a recent hearing on the defense policy bill. "And I can't really discuss some of that here in this setting, but there are some major issues when it comes to vetting," said Russell, who serves on the Armed Services Committee. In the next few weeks, Mattis is expected to receive final recommendations from Pentagon personnel and intelligence officials about the way ahead.